These cookies had mixed reactions from the people that I shared them with. I had to assure my husband that those orange bits in them were not carrots before he would eat them. The ones I left in the staff lounge at work were all eaten, but some liked them more than others. They really weren’t visually appealing. I used a bar of Trader Joe’s Pound Plus dark chocolate which was an excellent choice, but it really was a lot of chocolate, even for a chocolate lover like me. You could easily cut the chocolate to 3/4 of a pound instead of a full pound. Those orange bits that my husband thought were carrots are actually apricots. I used dried apricots and soaked them overnight in water, drained them and then weighed them to the correct amount. For the mocha part of these cookies, the recipe calls for instant coffee powder, which I didn’t have. I did have espresso powder so instead of the 2 to 3 tablespoons called for in the recipe I substituted 1 tablespoon of espresso powder. Some of the bakers used a packet of Starbucks “Via”, which I actually think would work better than using the espresso powder. One more tip if you want to try this recipe for yourself, use parchment paper to line the baking sheets for easy removal. The cookies spread out a lot and tend to fall apart when you remove them from the baking sheet. For the second batch I let the cookies sit on the cookie sheet for about 5 minutes before trying to remove them. Would I make this recipe again? Maybe. I thought the cookies were ok, and I ate more than I should have, but who could resist all that chocolate? I actually liked the addition of the apricots and may try adding some to my regular chocolate chip cookie recipe. 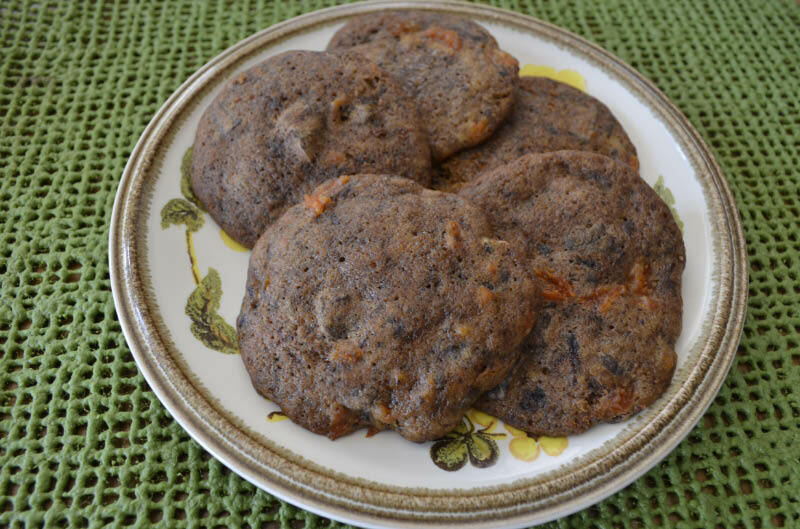 So if I have convinced you to give these cookies a try, then visit Peggy of Galettista for the recipe. If you want to see the posts of all the other Baking with Julia bakers, then check out the LYL post on the Tuesdays with Dori blog for links to all the blogs of this weeks participants. The first recipe assignment for March was to make croissants. I just didn’t have the time to tackle them, but am hoping to make them sometime. Congrats to all who made them! Your cookies look lovely with the apricots showing through. I decided to use dried cherries, as that was what I had on hand. (plus I love the combo of chocolate and cherry) They were really good cookies. Carrots may not be all bad! Ha ha ha. I really enjoyed this recipe. I used the full three tablespoons of instant espresso and there was barely a hint of coffee flavor in the baked cookie. I hope you get a chance to make the croissants – they really are worth all the work. We just finished off the last three that were in the freezer. Still were wonderful! I also formed them the night before and let them rise the following day. Worked well.